Rotterdam, Netherlands, 1 March 2019 – a consortium of world-leading companies comprising Air Liquide, Nouryon (formerly AkzoNobel Specialty Chemicals), Enerkem and the Port of Rotterdam – has announced that Shell will join as a partner in Europe’s first advanced waste-to-chemicals facility in Rotterdam, the Netherlands. Shell will become an equal equity partner in the proposed commercial-scale waste-to-chemicals (W2C) project, which will be the first of its kind in Europe to make valuable chemicals and bio-fuels out of non-recyclable waste materials. The consortium, which has set up a dedicated joint venture company, has already undertaken extensive preparatory work, covering detailed engineering and the permitting process. It aims to take the final investment decision (FID) later in 2019 as it pursues the development work and finalizes the selection of an engineering and procurement contractor (EPC). The planned facility will convert up to 360,000 tons of waste into 220,000 tons (270 million litres) of bio- methanol – a chemical building block that is used to manufacture a broad range of everyday products, as well as being a renewable fuel. This represents the total annual waste of more than 700,000 households and represents a CO2emission savings estimated at about 300,000 tonnes when compared to the production of methanol from fossil fuels. The project is supported by the Dutch Ministry of Economic Affairs & Climate Policy, which has agreed to develop mechanisms and regulation that will help bring this new technology to full scale to support the low-carbon transition of the Dutch economy. The waste-to-chemicals project is also supported by the City of Rotterdam, the Province of Zuid-Holland and InnovationQuarter, the regional development agency. The facility will be built within the Botlek area of the Port of Rotterdam using Enerkem’s proprietary technology, and will convert non-recyclable mixed waste, including plastics, into syngas and then into clean methanol for use in the chemical industry and for the transportation sector. This is a departure from the reality of today, where methanol is generally produced from natural gas or coal. The plant will have two production lines, or twice the input capacity of Enerkem’s commercial plant in Edmonton, Canada. It will benefit from the state-of-the-art infrastructure available within the Port of Rotterdam, as well as synergies with Air Liquide (large industries) for supplying the required oxygen and with Nouryon, for the hydrogen raw material. The current aim is that the facility’s sustainable methanol output will be purchased by Nouryon and Shell. The waste-to-chemicals project in Rotterdam is an important step towards a more sustainable chemical industry and circular economy. Leveraging Canadian cleantech Enerkem disruptive proprietary technology, the commercial-scale facility will be the first of its kind in Europe to provide a sustainable solution for non-recyclable wastes, converting unrecoverable plastics and other mixed waste streams into new raw materials. The waste-to-chemicals project in Rotterdam is a prime example of how a true circular economy can be achieved by preventing the use of fossil sources for new materials, diversifying the energy mix and by making everyday products lower carbon while offering a smart, sustainable alternative to landfilling and incineration. The project can help the Netherlands realize its ambition to become virtually carbon-neutral by 2050. 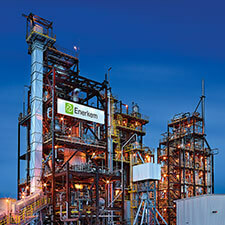 Enerkem produces advanced biofuels and renewable chemicals from waste. Its disruptive proprietary technology converts non-recyclable, non-compostable municipal solid waste into methanol, ethanol and other widely-used chemicals. Headquartered in Montreal (QC), Canada, Enerkem operates a full-scale commercial facility in Alberta as well as an innovation centre in Quebec. Enerkem’s facilities are built as prefabricated systems based on the company’s modular manufacturing infrastructure that can be deployed globally. Enerkem’s technology is a prime example of how a true circular economy can be achieved by diversifying the energy mix and by making everyday products greener while offering a smart, sustainable alternative to landfilling and incineration. .Great news: @enerkem closes a new round of financing for $76.3 M.